To help you gather this information, we created a self-segmentation box. It's an easy way to survey your visitors with a single question and to group them into audiences. 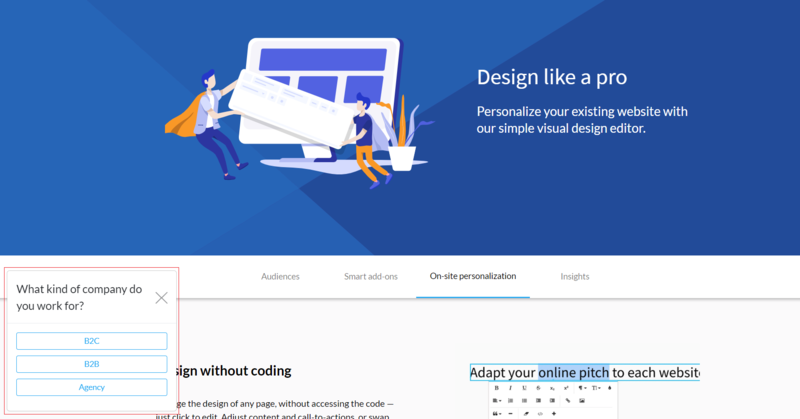 This allows you to personalize your content, explain your product from their perspective, and highlight the right features. On top, self-selection gives you a better understanding of how your website traffic is composed and who your best-converting visitors are. To read more about how powerful this tool can be, take a look at the case study about ClassTag, a customer that increased conversion rate by 150% using self-segmentation. Above, an example of a self-segmentation box we created for the Unless features page. Here, we're asking our visitors about their company type. Based on the response, we dynamically change how we pitch our solution and highlight different features. When the visitor chooses one of the provided answers, they will be assigned to the corresponding audience. From our experience, it is best to limit the number of possible responses to 3-6. If there are too many options, visitors seem to get overwhelmed and you can always follow up with a second question later on. As the name suggests, self-segmentation means that the answer a visitor chooses will decide upon which audience they belong. So, before you create your self-segmentation box, make sure to set up the corresponding audiences. Choosing a generous membership duration (e.g. 30 days) will help you better understand how your website traffic is composed. Click on the "New personalization" button, select Smart add-on and switch to the Side boxes tab. 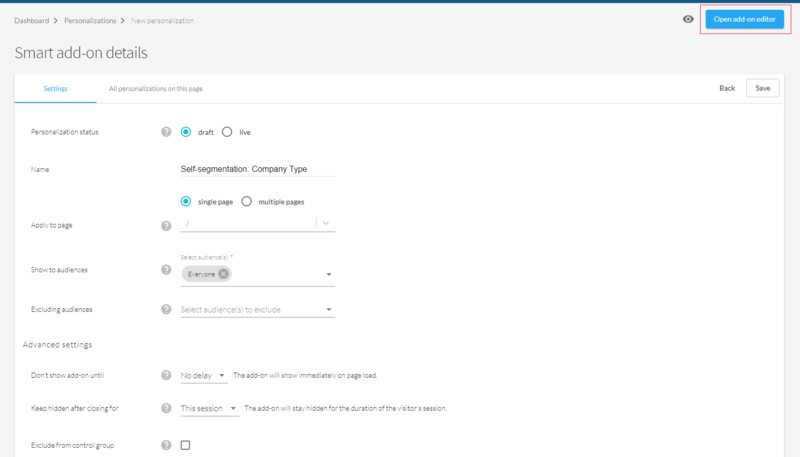 From here you can pick a self-segmentation box and customize it in the next steps. First, you will have to decide on the display settings. Choose on how many pages you would like to show the box (one page vs. multiple pages) and define an audience (typically the "Everyone" audience). By default, anyone who has already given their response will be excluded from seeing the self-segmentation box again. In the advanced settings, you can determine when the add-on appears and how long it remains hidden after a visitor interacted with it (ie closed the add-on or chose a response). Once you're done, click on "Open add-on editor". From here you can design your box. Choose Modal to insert your question and to adjust the size, position, colors, and fonts of the self-segmentation box. Under Buttons, you can style the answers. Above, a design of a self-segmentation box with three possible answers - B2B/B2C/Agency. Audiences is where you define the response options and assign audiences. As an example, the GIF above shows that a visitor who chooses "I work in B2B" will be labeled as a member of the "B2B" audience. Bear in mind that if you haven't created any self-segmentation audiences yet, the suggestion list will remain empty (go back to step 2). 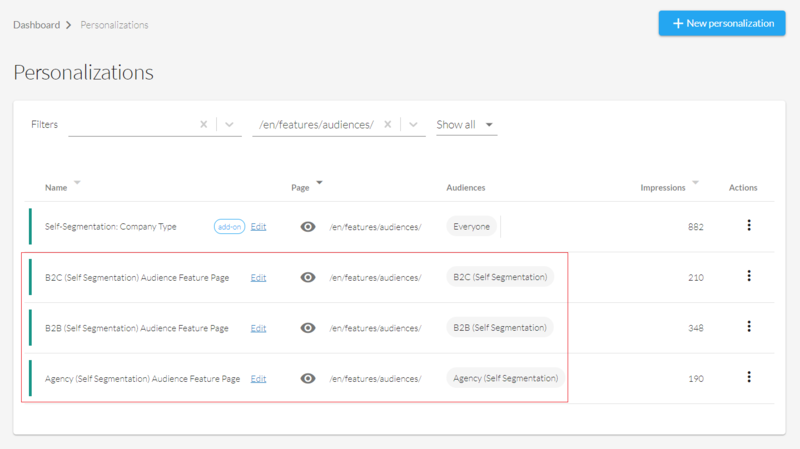 Once you set your self-segmentation box live, visitors can start responding and assigning themselves to your audiences. Now you can create on-site personalizations that correspond to the needs of each audience. As shown in the screenshot above (click to enlarge) we used a self-segmentation box on our own website. It labels visitors as B2B/B2C/Agency. Next, we created three personalizations for our features page (B2B, B2C, Agency). Which personalization visitors will see, depends on their label.